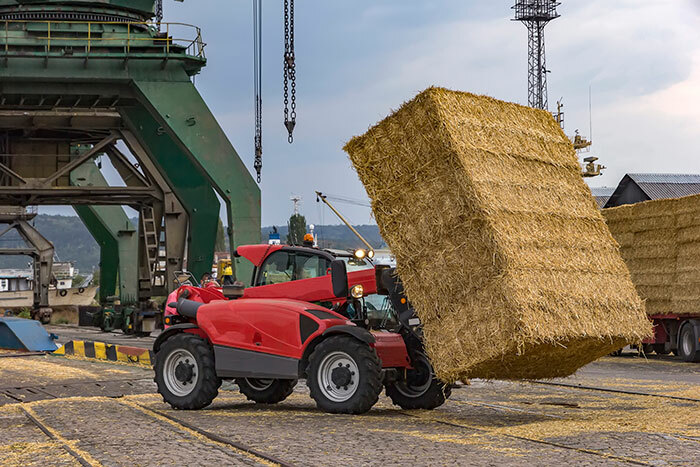 Albeit delayed, the USDA Foreign Agricultural Service (FAS) recently posted the U.S. hay export totals for 2018. For exporters, the news wasn’t particularly good, but it could have been much worse. Total exports of alfalfa and other hay (think grass) dropped from the record 4.2 million metric tons (MT) in 2017 to 3.9 million MT in 2018, a 7.2 percent reduction. The last time the U.S. had a year-over-year drop in hay exports was 2014, which was precipitated by a West Coast dockworkers strike. Alfalfa hay exports in 2018 totaled 2.45 million MT; down 4.5 percent from 2017’s record 2.66 million MT. Sorting out the impact that the 2018 China-imposed tariffs had on this decline is somewhat difficult. Here’s why. China’s 2018 import total of U.S. alfalfa hay was 877,960 MT; that was down 292,915 MT, or 25 percent, from 2017. However, compared to 2017, China had already purchased 135,766 fewer MT of alfalfa hay from the U.S. during the January through June period, before the additional tariffs were imposed. From July through December, they purchased 157,149 fewer MT than during the same period in 2017. So, although the changed tariff situation no doubt had an impact on total Chinese alfalfa hay purchases in 2018, there were additional factors at play. For one, alfalfa hay was more expensive in 2018 compared to 2017, and this may have scared off buyers early in the year. The shortfall of Chinese alfalfa purchases in 2018 was significantly offset by additional U.S. alfalfa hay going to other countries. 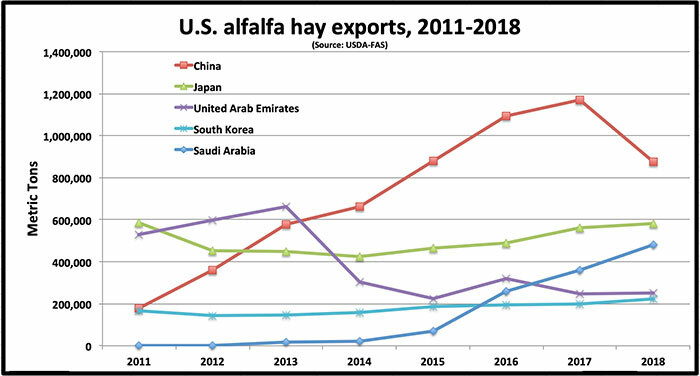 Japan, United Arab Emirates (UAE), South Korea, and Saudi Arabia all imported more U.S. alfalfa in 2018 compared to 2017; some, significantly more. During 2018, Saudi Arabia imported 120,387 MT more U.S. alfalfa than it did the previous year. This huge jump is largely due to that country’s diminishing water supply and the government mandate to shut the spigots off for most of their domestic alfalfa production. 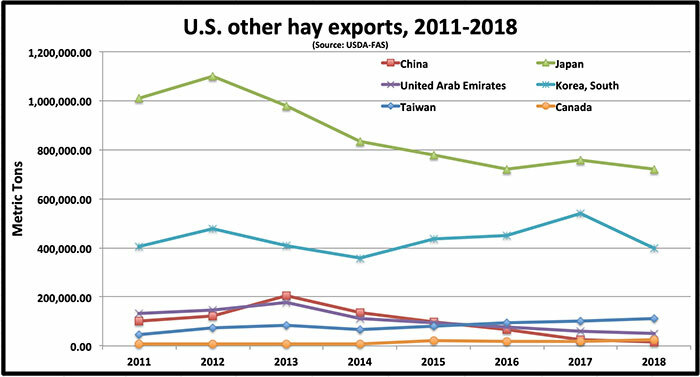 The Saudis’ 2018 U.S. alfalfa hay import total was 480,888 MT, solidifying their third-place standing among U.S. alfalfa export partners, behind China and Japan. The UAE was another interesting alfalfa hay export study in 2018. During the first half of the year, that country imported just 61,000 MT of U.S. alfalfa; however, from July through December, it imported over three times that amount. When China started looking elsewhere for their alfalfa post-tariffs, it apparently took some of the production from countries where the UAE had previously been purchasing. This prompted the UAE to buy more U.S. alfalfa. Japan imported 583,106 MT of U.S. alfalfa hay in 2018, up 4 percent from 2017 but nearly 100,000 MT more than 2016. South Korea’s total alfalfa hay imports from the U.S. were up nearly 11 percent in 2018. USDA-FAS reported 1.35 million MT of hay other than alfalfa was exported from the U.S. in 2018. That was 12 percent below the 2017 amount. Japan, the leading importer of U.S. grass hay, purchased 721,154 MT in 2018, 5 percent less than 2017. The second leading importer of U.S. hay other than alfalfa, South Korea, bought 398,953 MT in 2018; this was 26 percent fewer MT than they imported in 2017. Rounding out the top five export trade partners for hay other than alfalfa were Taiwan (111,238 MT), UAE (50,652 MT), and Canada (24,415 MT). Year-over-year U.S. hay exports dropped for the first time in four years during 2018. Hay exports still remain a small portion of total U.S. hay production. Based on USDA production data for 2018, less than 3.5 percent of all hay produced enters the export market and about 5.3 percent of U.S. alfalfa does the same. In the seven Western states of Arizona, California, Idaho, Nevada, Oregon, Utah, and Washington, hay exports play a much larger role in impacting markets and prices. According to Dan Putnam, University of California forage extension specialist, hay exports make up about 41 percent of the grass hay production and 17 percent of the total alfalfa production in those Western states. 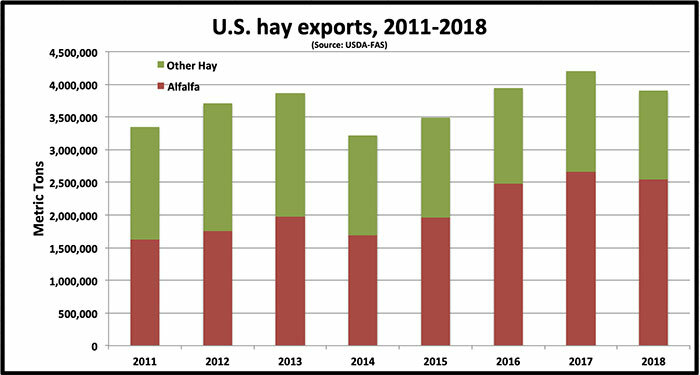 It seems that 2019 will be a pivotal year for U.S. hay exports. If the tariff situation doesn’t get resolved quickly, China will continue to source additional alfalfa from countries other than the U.S. Even if there is a resolution, it’s unclear whether all the previous gains made with China as an alfalfa trade partner will be recaptured. Though the tariffs were a negative factor in 2018, many other issues were at play and some of those were very positive for the future. Saudi Arabia, for example, is expected to continue to purchase growing amounts of U.S. alfalfa due to its shortage of water.